"Interpreting X-ray images to diagnose pathologies like pneumonia is very challenging, and we know that there's a lot of variability in the diagnoses radiologists arrive at," said Pranav Rajpurkar, a graduate student in the Machine Learning Group at Stanford and co-lead author of the paper. "We became interested in developing machine learning algorithms that could learn from hundreds of thousands of chest X-ray diagnoses and make accurate diagnoses." The work uses a public data set initially released by the National Institutes of Health Clinical Center on Sept. 26. That data set contains 112,120 frontal-view chest X-ray images labeled with up to 14 possible pathologies. It was released in tandem with an algorithm that could diagnose many of those 14 pathologies with some success, designed to encourage others to advance that work. As soon as they saw these materials, the Machine Learning Group—a group led by Andrew Ng, PhD, adjunct professor of computer science—knew they had their next project. "The motivation behind this work is to have a deep-learning model to aid in the interpretation task that could overcome the intrinsic limitations of human perception and bias, and reduce errors," explained Lungren, who is co-author of the paper. "More broadly, we believe that a deep-learning model for this purpose could improve health care delivery across a wide range of settings." Also detailed in their arXiv paper, the researchers have developed a computer-based tool that produces what looks like a heat map of the chest X-rays—but instead of representing temperature, the colors of these maps represent areas that the algorithm determines are most likely to represent pneumonia. 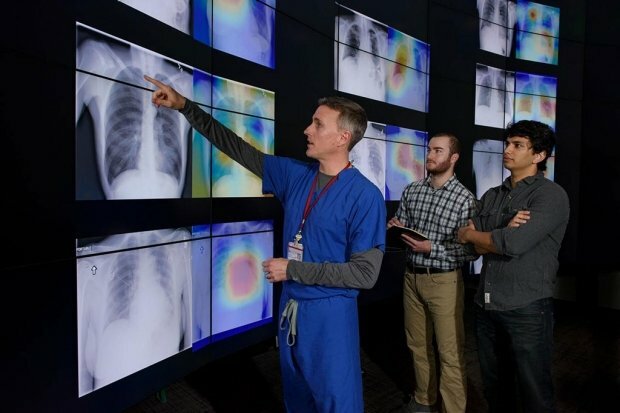 This tool could help reduce the amount of missed cases of pneumonia and significantly accelerate radiologist workflow by showing them where to look first, leading to faster diagnoses for the sickest patients. "We plan to continue building and improving upon medical algorithms that can automatically detect abnormalities and we hope to make high-quality, anonymized medical datasets publicly available for others to work on similar problems," said Jeremy Irvin, a graduate student and co-lead author of the paper. "There is massive potential for machine learning to improve the current health care system, and we want to continue to be at the forefront of innovation in the field."